Lots of my children are very kineasthetic learners and so I have used sensory tubs to practice our counting. 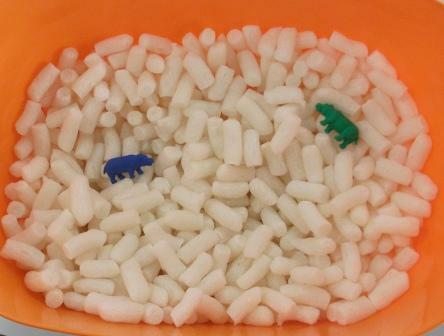 Currently in our tubs are corn starch beads used in packaging boxes. Amongst these beads are hidden 20 zoo animals. (These were chosen because of our current construction of a zoo.) The children love to search through the tub and find the animals. I also have some laminated cards with numbered squares up to 20 to assist them in counting. The children can place an animal in each square, which assists with 1 to 1 correspondence and numeral recognition as well as engaging in conversations about how many have been found and how many are left to find. I have at least 4 of these made up at any one time. 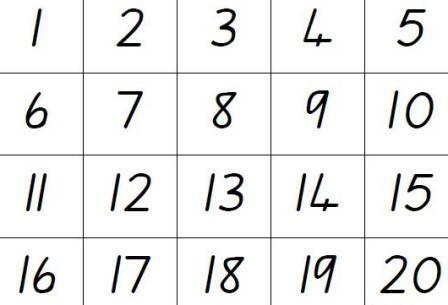 These are up to 20 but you can make it for any number and groupings. 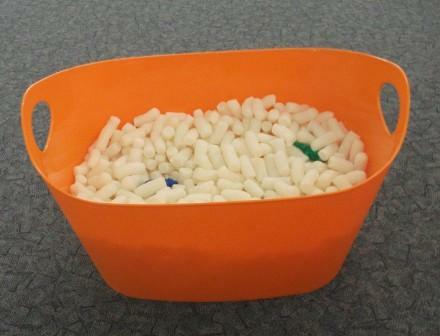 The use of these tubs is endless and I will post more ideas as we use them in the classroom. I love this – I am going to link you on my blog and facebook page – great idea! I can see this used for the alphabet as well! Great idea. I’ve had things for kids to find, but haven’t used the number card idea. Thanks. So glad you like the idea. The use of these is endless: alphabet, shapes,colours animals etc,etc. So timely – a parent just donated a bag of these to us at preschool and I’ve been wondering what to do with them! love it!!!! What a fantastic idea for all those kinesthetics out there. Yeah you!! !